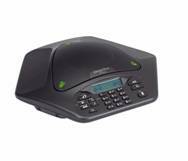 A wireless, tabletop conference phone, the MAX Wireless system can turn any room into a conference room. The wireless capabilities entail far more than a clean look; providing the freedom to take the conference with you from room to room, with secure, encrypted transmissions. Powerful HD Conference™ processing provides the crisp, clean audio you expect from ClearOne, in a professional conferencing system that can move from the executive office to small conference room with ease.